The Gothic period followed the Romanesque period in Europe, and though both periods are considered more broadly part of the Middle Ages, there are striking differences visible to travelers. Gothic styles existed in all the arts — music, painting, sculpture, and literature among them — but first of all, in architecture. Though there is important Gothic secular architecture, Gothic architecture is defined above all by the great cathedrals, and was invented by the Abbot Suger (c. 1081–1151), who designed a new, grand Cathedral of Saint-Denis to replace the preexisting one. 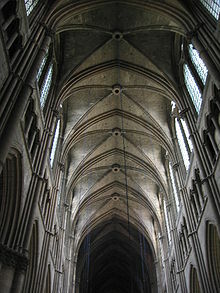 The great engineering achievement of the Gothic cathedral is the creation of flying buttresses which distribute the weight of the very high vaulted ceilings outside and enable them to stand. The Gothic cathedrals were some of the tallest skyscrapers of yesteryear — often visible for a very long distance while pilgrims approached on foot — and their high, vaulted ceilings were meant to create a microcosm of the heavens and strike the worshippers with awe at the power of God and wonder of the Creation, but even atheistic visitors of the present day can be impressed by the invention, skill, and beauty of the buildings' construction. It is still worth seeing the cathedral at Saint Denis, which is a short Metro ride plus a bit of a walk from Paris, though because of later additions, it no longer appears as it did when it was the prototype for all other Gothic cathedrals. However, there are many other great Gothic cathedrals to see throughout France, and in various other European countries. Though the Church was at the peak of its power during the Gothic period, secular life also flourished, and quite a number of lovely secular buildings from those times are still with us today, as well. Belgium seems to be a particular hotbed of Gothic secular buildings, including city halls in Brussels, Leuven, Mons, and Oudenaarde. Poland, Italy, France and Germany also have a number of very striking Gothic secular buildings. Altar The altar of a church is where the priest(s) officiate(s) during Mass. The priest also may give a sermon from a pulpit, which may be meticulously and ornately sculpted. Another thing to look for on the altar is a baptismal font, used to ritually bathe people (especially infants) in holy water. Instead of a font inside, there is sometimes a separate baptistery building close to a cathedral, and if so, it is usually beautiful and a major attraction. Bell tower Bell towers of churches and city halls are impressively high and often worth climbing for great panoramic views. Ceiling High, vaulted ceilings are typical of Gothic religious architecture. At one time, they were probably all painted, and some, especially in chapels, are still painted. Choir The choir, which is a set of rows of benches behind the altar that the chorus uses while singing Mass, may be made out of marble or beautifully carved wood, possibly with intarsial work (inlaid wood of contrasting colors). Doors Don't ignore the doors. Whether wooden or metal, they often have great decorations. Façade This is the entire front exterior of a building, which was often in constant view for more than an hour in the days when masses of people walked for long distances in order to arrive. As this is the face of the building that most presents itself to the public, many Gothic buildings are known above all by their often ornately decorated, impressively tall façades. Flying buttresses These are stone braces that extend from the sides and back of a Gothic church that's made from stone, support the weight of its ceiling, and allow it to stand. Their purpose is primarily practical, but they are also characteristic and worth seeing. Nave The nave, which is the center aisle that extends from a church's front door to its altar, is a common feature of most churches, but Gothic cathedrals have particularly long, impressive naves. Pavement The pavements (floors) of Gothic buildings may use marble of different colors or have other decorations. Also, look for the tombs of important people, who may be buried below the pavement of a major cathedral and memorialized in stone near where you step. Rose windows Gothic cathedrals are usually cruciform (in the form of a large cross). The rose windows are essentially circular sets of windows, separated into petal shapes. They are usually on the right and left points of the cross, and often also above the front entrance. Stained glass windows during the Middle Ages told stories the parishioners could understand, even if they were illiterate. The light that shined through the colorful glass was also meant to represent heavenly jewels. While great cathedrals may have many panes of stained glass, the rose windows are usually the crowning achievement of the glass-makers who participated in the construction of the churches. Transept In cruciform buildings, this is the transverse section at right angles to the nave, which connects the points of the cross to each other. Tympanum The tympanum (plural: tympana) is a niche just above the front and often side doors of a cathedral. There are often impressive scenes carved into the stone of the tympana. In parts of Northern Europe where building stones were not available (due to being "buried" in hundreds of meters of ice age sediment), including Northern Germany, Denmark, Sweden, Finland, Lithuania, and parts of Poland, clay was plentiful, and therefore bricks were used to build Gothic buildings in those areas. The much lesser weight of the bricks made flying buttresses unnecessary, so they were not used even for very large brick Gothic edifices. Also, bricks cannot be carved like stone, so brick Gothic buildings do not have statues that were carved into their façades after the stone was laid. Instead, all ornaments had to be built separately, and statues of figures (e.g., from the Bible or of saints) are usually not present in their exteriors. As Gothic architecture is primarily religious, the fan of Gothic architecture usually seeks out great Gothic cathedrals and chapels, above all. Nicosia: Selimiye Mosque was put inside the never-finished Agia Sofia Cathedral, after which two minarets were added and rich sculptural decoration and frescoes were destroyed. Kutná Hora has a great UNESCO-listed Gothic cathedral. Prague is absolutely full of Gothic architecture, such that a visit to the city should be a priority for anyone who appreciates this style of building. One of Prague's first Gothic buildings was the Old New Synagogue, now Europe's oldest active synagogue. Odense's St. Canute's Cathedral is a brick Gothic construction. Roskilde's cathedral was the first Gothic cathedral to be made out of brick. Amiens has a famous Gothic cathedral. Auxerre's cathédrale Saint Etienne is a Gothic cathedral with a Romanesque crypt (basement). Beauvais' Cathedral is a good example of the Gothic building process - the cathedral was supposed to be the largest, collapsed several times during construction and was never finished. Bourges has a famous Gothic cathedral. Chartres: Chartres' Gothic cathedral is very arguably one of the greatest in the world, and the primary reason loads of tourists make a day trip from Paris to this small city. Dijon has a pretty Gothic cathedral (Cathédrale Saint-Bénigne de Dijon). Laon has an important early Gothic cathedral, completed in 1215. Orléans has an impressive Gothic cathedral which is famous for its association with St. Joan of Arc. Paris: In Paris, there is the great Notre Dame, severely damaged by fire on 15 April 2019, and also the Sainte-Chapelle, both on Île de la Cité in the 4th arrondissement. Reims: The cathedral of Notre-Dame de Reims is another famous one. The preeminent poet-composer of 14th-century Europe, Guillaume de Machaut (c. 1300-1377), was a canon at this cathedral starting in 1333 and his Missa Notre Dame (Mass of Our Lady, probably composed in the 1360s), the first full setting of an entire set of ordinary (standard) mass prayers to music by a single composer, was written for and performed in the context of masses that took place in that cathedral. Machaut's mass, for four voices, is in the then-new Ars Nova ("New Art") style, which used complex mathematical proportions similar to those used by Gothic architecture, and overlapping melodies and rhythms to take advantage of the cathedral's echoey acoustic. Rouen has the Gothic cathedral of Notre-Dame de Rouen, the image of whose façade was famously painted in several kinds of light by the Impressionist painter, Claude Monet. It also has a beautiful abbey church, Saint-Ouen de Rouen. Saint-Denis, the home of the original, though subsequently altered Gothic cathedral. Semur-en-Auxois: The Collégiale Notre-Dame has impressive statues carved into its exterior and beautiful stained glass windows. Sens has the famous Cathédrale Saint-Étienne de Sens. Strasbourg has a famous, unique Gothic cathedral. Vézelay has a large cathedral in mixed Romanesque/Gothic style, which is a traditional place for pilgrims to go to and start their pilgrimage to the great Romanesque cathedral in Santiago de Compostela. Cologne's cathedral was not completed until the 19th century, but to the original plan. It is the largest Gothic cathedral in northern Europe. Halle's Marktkirche Unser Lieben Frauen (also called the Marienkirche) is an important late Gothic structure that was begun in 1529 as a Catholic cathedral but converted into a Lutheran cathedral even before construction was completed in 1554. Landshut's St. Martin's Church is the tallest brick building and church in Germany. Magdeburg has a cathedral that is Protestant and also the oldest Gothic cathedral in Germany. Munich's Frauenkirche is a Gothic structure with a unique history. Its twin towers (completed later in a Renaissance style) are emblematic of Munich, but the cathedral lacks many of the decorative details common to other Gothic churches. Regensburg has a Gothic cathedral that was begun in 1273 and finished almost 600 years later! This striking building is a notable part of the city's skyline. Trier's Liebfrauen Kirche (Church of Our Lady) is an important and impressive structure, though only part of it (notably, the vaulting) is Gothic. Ulm Minster was begun in the Gothic era but, like Cologne Cathedral, wasn't finished until the 19th century. It is still the tallest church in the world (until Sagrada Familia is finished). Florence: The Duomo (Basilica di Santa Maria del Fiore) is Gothic. Santa Maria Novella and Santa Croce were also Gothic, though both were remodeled by Giorgio Vasari in the 16th century, so their interior has been changed. Milan's Duomo — the 5th-largest cathedral in the world — is also Gothic. Orvieto's small Duomo and the art inside are the main reason people come to visit this charming town. Priverno, in the Province of Latina, is home to the Cistercian Abbazia di Fossanova (Abbey of Fossanova), whose church was built from 1163 to 1208 in early Burgundian Gothic style. Siena's Duomo (cathedral), along with Orvieto's smaller Duomo, represents the black-and-white striped stone style of Italian Gothic architecture. The Baptistery (separate entrance), whose interior features a great baptismal font sculpted by the most famous Gothic sculptors in the region, is also a major draw for fans of great Gothic architecture. Venice has several Gothic churches, including the Basilica di San Marco. Vilnius: St. Anne's Church and Bernardine Monastery. Trondheim: The Nidaros Cathedral is a symbol of the city and probably one of the northernmost major Gothic buildings in the world. Gdańsk's St. Mary's Church is supposedly the largest brick church in the world. Kraków has several Gothic buildings. St. Mary's Basilica, with its two asymmetrical tall towers, is probably the most famous, but there are several other churches and also a Gothic synagogue (Old Synagogue in Kazimierz). Sibiu's 14th-century Lutheran Cathedral (German: Evangelische Stadtpfarrkirche in Hermannstadt, Romanian: Biserica Evanghelică din Sibiu), with a tall steeple, several turrets, and numerous triangular protuberances in its façade, is a building of striking beauty. León and Burgos have impressive Gothic cathedrals. Barcelona's medieval core, aptly named Barri Gòtic, is home to many beautiful Gothic churches; the cathedral's façade is from the 19th century, though. Nearby, the massive Templo de La Sagrada Família, the soon-to-be-finished masterpiece of the genial architect Antoni Gaudí, is actually a wholly Gothic-inspired design; Gaudí took over a Neo-Gothic project already in construction. Architecture lovers cannot be excused to miss it. Uppsala has a brick Gothic cathedral. Istanbul's last remaining Gothic building is Arap Mosque in Karaköy. Canterbury: The Canterbury Cathedral, famous as a place of pilgrimage from Chaucer's Canterbury Tales, is mostly Gothic. London: Westminster Abbey, the principal church of British royalty, is essentially Gothic. Salisbury's 13th-century cathedral, in early English Gothic style, has the tallest church spire in the UK. Winchester has a very famous Gothic cathedral. York Minster has its own unique mix of Gothic styles. The boundary between sacred and secular was not always a hard line in the Gothic period, as cities and their governments (such as in Siena) were consecrated to the Virgin Mary, and hospices were run by the Catholic Church as an act of sacred charity and contained chapels and works of sacred art inside. For the purposes of this guide, everything not primarily intended as a house of worship or a monastery has been defined as secular. In addition to the specific buildings mentioned below, the unique town of Pienza in Tuscany was completely redesigned in a Gothic style at the command of Pope Pius II, and its historical center, a UNESCO World Heritage site, remains an intact Gothic town to this day. Beaune: The Hôtel-Dieu, which was a hospice run by nuns, is a splendid example of a large Burgundian Gothic building that is neither a cathedral nor a government office. Brussels' city hall (Hôtel de ville/Stadhuis) is Gothic. Dijon, the capital of the Dukes of Burgundy before Beaune, contains the Gothic Palais des Ducs, now a museum containing great Burgundian art and also a great building in its own right. Kaunas' House of Perkūnas is the oldest residential building still standing in Lithuania. Kraków's Collegium Maius, Jagiellonian University's oldest building, was rebuilt in the 15th century as a late-Gothic structure surrounding a courtyard. Leuven has an extremely ornate Gothic city hall. Lübeck's Heiligen-Geist-Hospital (1260) is one of the oldest operating social institutions in the world. Münster's Rathaus (city hall) is a striking example of secular Gothic architecture. Munich's Altes Rathaus is a Gothic building. Ironically, partly because its exterior is clean, it looks newer than the city's neo-Gothic Neues Rathaus, which was completed in the 20th century. Oudenaarde has a flamboyant Gothic city hall. Paris The Conciergerie, a Medieval fortress and prison, still has Gothic elements, for example the Hall of the Guards. Pienza This entire Tuscan town was rebuilt in Gothic style in the 15th century, in honor of Pope Pius II, and therefore contains both a Gothic Duomo and Gothic palazzi. Rouen's Palais de Justice is in very ornate flamboyant (late) Gothic style. San Gimignano: This small town is chock full of Romanesque and Gothic buildings, including several towers. Siena is even more famous for secular than religious Gothic architecture, as its heyday as a city-state was during the Gothic period. The Palazzo Pubblico (city hall) is the most famous secular Gothic building in town; the Palazzo Sansedoni opposite the Palazzo Pubblico and the Palazzo Chigi on via di Città above the Piazza del Campo are probably the next most famous. Toruń: The city hall (Ratusz) and Copernicus House are Gothic. Venice: Doge's Palace, Ca' d'Oro and several other palazzi. Wrocław's city hall (Ratusz) is a beautiful example of Gothic secular architecture. Corvin Castle in Romania is an example of a historic building that was renovated to meet current standards of how a real Gothic castle should look. Karlštejn's Gothic castle hides deep in the forest. Kraków houses remnants of city walls with armoury, Florian Gate and one of last surviving barbicans. Lübeck, sometimes called the "mother" of Brick Gothic, boasts, among other buildings, two surviving city gates: Holstentor and Burgtor. Malbork Castle of the Teutonic Order, the largest brick building in Europe, is a fine example of Gothic defense architecture. In the 19th century, there was a fascination with the Middle Ages that included a revival of interest in medieval tales like the legends of King Arthur and the Knights of the Round Table, Tristan and Iseult (Tristan und Isolde in German), and the Norse tales that were famously set to music by German composer, Richard Wagner in Das Ring des Nibelungen, informally known as the Ring Cycle of four operas. It is in this context that neo-Gothic or Gothic revival architecture, born in the mid-18th century in England, became an almost irresistible force. The Gothic revival has flourished ever since and given many people far beyond Europe the experience of an echo of the Gothic past, with its sense of monumentality, authoritativeness and appeal to tradition, but without the Crusades, black death, and inquisitions that caused suffering in Medieval times. Since the Gothic revival began in England, it is especially in the UK and English-influenced lands like Canada and the United States that neo-Gothic buildings were built in large quantities. However, neo-Gothic edifices can be found throughout Europe and as far afield as Jakarta, Indonesia. St. John's Anglican Cathedral in Brisbane is a famous Neo-Gothic cathedral in Australia. Budapest has several neo-Gothic buildings. Especially famous and beautiful is the Parliament. Karachi's Frere Hall is quite pretty. Kolkata: St. Paul's Cathedral, built during the British Raj from 1839-1847, is in neo-Gothic style. Linz's Neuer Dom (New Cathedral) captures a lot of the beauty of a Gothic cathedral and is well worth visiting. London's famous Tower Bridge is a neo-Gothic structure, as is the Palace of Westminster where the Parliament meets, the beautiful St. Pancras Station, and the British Natural History Museum, among several other structures. Montreal: The Basilique Notre-Dame-de-Montréal, with its gorgeous interior, is by itself a reason to visit Montreal. Munich: The Neues Rathaus is one of the greatest neo-Gothic buildings in the world and might be a reason to visit Munich by itself, if there weren't so much else to see. New Haven: Yale University's Harkness Tower, which literally towers over the city, is an iconic neo-Gothic structure, one of several on campus. New York City's Cathedral of St. John the Divine, St. Patrick's Cathedral and Riverside Church are all Gothic revival constructions, though highly varied from each other in appearance and shape. Olomouc, Czech Republic, features the Saint Wenceslas Cathedral, which was rebuilt in neo-Gothic style in the 19th century, with some older elements incorporated. Ostend's Saint Peter and Saint Paul’s church (Sint-Petrus-en-Pauluskerk) is impressive. Ottawa: The Parliament and Confederation Building are among several neo-Gothic structures in Ottawa. Paisley, Scotland is home to the impressive Thomas Coats Memorial Baptist Church. Pittsburgh's East End has a number of fine examples of Neo-Gothic architecture on the campus of Pittsburgh University, including the magnificent Cathedral of Learning and the Heinz Chapel with its spectacular stained glass. São Paulo's Sé Cathedral is the world's third-largest neo-Gothic church. Steyr, Austria has a beautiful neo-Gothic building, the Sparkassengebäude. Victoria, British Columbia is home to the Craigdarroch Castle, a Scottish Baronial-style neo-Gothic mansion commissioned by Robert Dunsmuir. His son, James Dunsmuir, commissioned another Scottish Baronial-style mansion, the Hatley Castle, in nearby Colwood. Vienna has the Votivkirche (Votive Church), which was constructed from 1856-1879. Zamora de Hidalgo, Mexico features the still not quite completed but already impressive-looking Santuario Guadalupano (Cathedral of Our Lady of Guadalupe), which is expected to reach a height of 105 meters. Hear a performance Many Gothic buildings have wonderful acoustics. Hearing a performance in a Gothic building, or even just a cathedral's organist warming up before playing a wedding, can be a memorable experience. And if you have the chance to hear Gothic music performed in a Gothic building, you may learn something that you could not discover otherwise about how it was intended or expected to sound when it was composed. Climb the bell tower In many churches and city halls it is possible to climb the bell towers and enjoy city views. Go to Mass if you are so inclined, and experience a Gothic cathedral in its originally intended function. In a few places, it is possible to stay inside Gothic or neo-Gothic structures which have been converted to hotels or other forms of lodging. London. There is a luxury hotel, the St. Pancras Renaissance London Hotel, which adjoins and is built in the same neo-Gothic style as the St. Pancras Station. Maastricht, Netherlands has accommodations in a Gothic monastery, complete with church, now known as the Kruisherenhotel. This travel topic about Gothic architecture is a usable article. It touches on all the major areas of the topic. An adventurous person could use this article, but please feel free to improve it by editing the page.